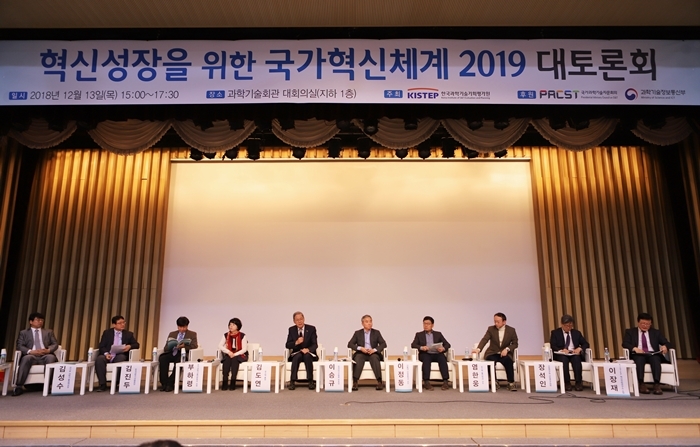 KISTEP held “2019 National Innovation System (NIS) for Innovative Growth Forum” at the Main Auditorium of the Korea Science and Technology Center on December 13th (Thur). The year of 2019, the third year of the Moon Jae-in administration, is the time to comprehensively review the major S&T policy implemented so far, and to discuss the direction of future policy and the 2020 S&T policy. In this light, KISTEP held the forum to reflect on the current national S&T policy and to suggest the direction of Korea’s future S&T policy. 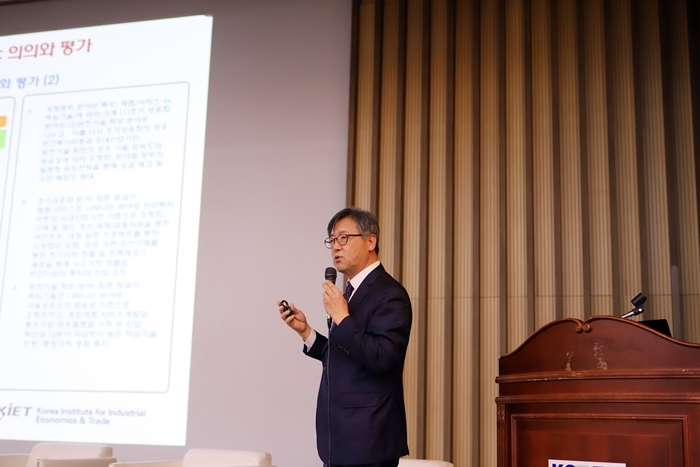 The forum began with a keynote speech by Professor Han Woong Yeom of POSTECH ("What is the Role of Government R&D in the Innovation Economy?"). 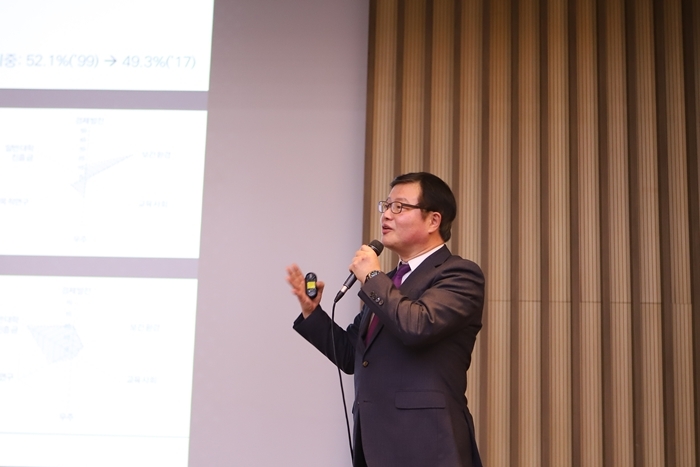 There were presentations followed by Director Jang-Jae Lee (Research Institute of S&T Innovation and Strategy, KISTEP) and Senior Research Fellow Sukin Chang (Korea Institute for Industrial Economics & Trade (KIET)); and the discussion with experts followed the last. 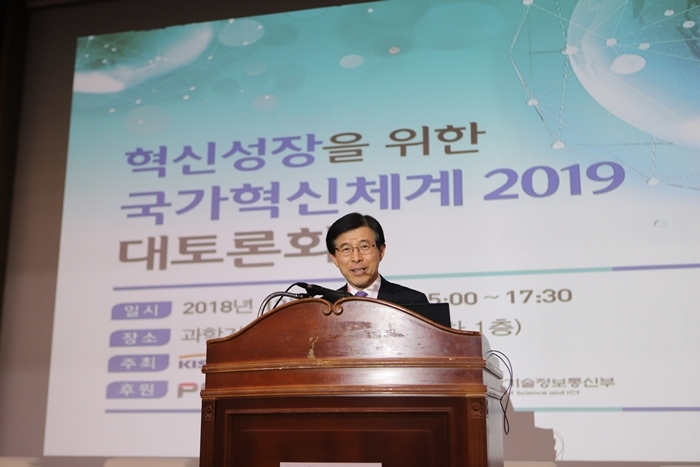 During the presentation of “National Innovation System, the Issues and Tasks in 2019," Director Jang-Jae Lee pointed out the increasing difficulties Korea has been facing by introducing statistical results; the decrease of total factor productivity (TFP), obsolete activities of technology innovation (frustrating the effort for transformation to the post catch-up innovation system), lack of new growth engine, and hollow achievement as number one country of R&D investment ratio to GDP. He then emphasized the importance of new innovation management system to counteract technology innovation in the 4th industrial revolution era and the role change between government and the private sector. As the issues in 2019, he suggested embarkation on activities for innovative growth, suggestion of integrated message and signal from the government, and establishment of new government role. Especially, he emphasized that the government should not be a leader of innovative growth, but rather become a vision provider, coordinator, and pace maker. He also urged the importance of specialized and differentiated role of government in the R&D, commercialization, and regulation areas. 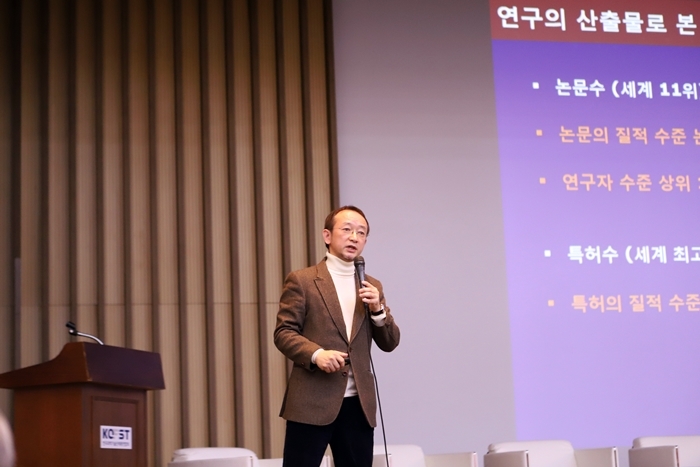 (1) Establish “The Vision for the Era of 20 Trillion Won for Government R&D Programs and Long Term Roadmap,” which will deliver reliability of innovative growth and a clear signal to the market and public; and will reflect the paradigm integrated with manufacturing industries and data economy. Also, establish Korean version of DARPA to increase the openness of military protection R&D programs, and develop and diffuse advanced technology. (2) Pursue innovative growth through strengthening connection between innovation bodies such as forming consulting groups to link private sector and government, promoting cooperation between enterprises, creating new ecosystem for new innovation growth, and fostering human resources in the field of advanced technology. (3) Design researcher-centered R&D system such as establishing evaluation system based on innovation capacity and creativity, and creating research-friendly environment and infrastructure. (4) Take an initiative as a control tower of KOSBIR programs of the Ministry of SMEs and Startups (MSS) for innovation of SME’s R&D programs, double the number of SME’s R&D by setting clear goals and strategies, enhance the capacity for designing R&D, differentiate the programs by each stage, develop SME’s demand-focused R&D programs, and introduce a supply-focused assistance system of R&D programs to foster innovative SME’s. (5) Establishing inspectorate system in Science, Technology and Innovation Office to strengthen its expertise and expand the function, enhancing comprehensive functions in microeconomics, and fulfilling a role as a control tower that connects research organizations in order to improve the governance for innovative growth. Additionally, it is also necessary to pursue inclusive growth through social problem-solving R&D and to extend investments in creative and challenging basic study. During the presentation of “Industrial and Technology Innovation Tasks for Innovative Growth”, Senior Research Fellow Sukin Chang pointed out, “The environment and the momentum for innovative growth has been deteriorating. Even though tangible and early achievements for the public is important, designing sophisticated and strategic policies are crucial such as setting policy goals for innovative growth (high - value added manufacturing and service industries); and selecting effective policy instruments and an implementation system. He then emphasized the need for expanding proactive and strategic government R&D investments to respond to the change of global production system and value-chain affected by the 4th industrial revolution and manufacturing fields which lead demands of components, raw materials, and equipment. Experts from various fields participated in the subsequent panel discussion including Doh-Yeon Kim (President of POSTECH), Young Joo Ko (President of Korea Technology Innovation Society (KOTIS)), Sung Soo Kim (Director of Science & Technology Policy Division, Science, Technology and Innovation Office, MSIT), Jin Doo Kim (President of Korea Science Journalists Association), Haryoung Poo (Member of Local Science and Technology Promotion Council Presidential advisory Council on S&T (PACST), Seung Kyu Lee (Vice President of Korea Biotechnology Industry Organization), and Jeong-Dong Lee (Professor of Technology Management, Economics and Policy Program, Seoul National University). They discussed the direction of the national S&T policy with opinions from experts and the public. Research Institute of S&T Innovation and Strategy of KISTEP plans to drive the diagnosis of the current situation and measurements for the main issues and tasks discussed in the forum. They will go through in-depth analysis and research, opinion gathering, and deliberative procedure with experts in KISTEP and outside experts.